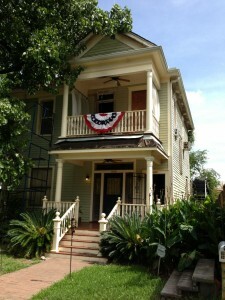 1615 Weber St. near downtown Houston is a grand old Victorian home awaiting restoration by a new owner. This home was originally a two story single family home, that was sometime in its past converted to an up/down duplex. It could easily be returned to single family status. The current owner has done the major foundation work, and rebuilt the porches. The electric was partially updated. The wide baseboards and window trim downstairs has been painstakingly scraped, stained and varnished. The floors have also been redone. The YouTube video shows some of the work done. It also shows what has not been done. Although a lot of work remains, the work that has been done shows how stunning this home could be. Upstairs has been partially gutted, and remains a work-in-progress.Imagine this house completely restored on its large 7000 SF lot. This First Ward neighborhood is in the shadows of downtown. So, if you are shocked by prices in the Heights for homes on small lots, imagine what this home could be restored to its original glory on this huge lot. It is now priced at $399,900. First Ward land is selling for ~$50/SF. See MLS # 59801171 for more details.